Monster Jam®, the unexpected, unscripted, and unforgettable family-friendly motor sport announced today that tickets are now on sale for the 2019 Greensboro event(s). The 2019 season will bring a new level of high-flying, four-wheel excitement to the entire family with six different competitions at the Greensboro Coliseum Complex on January 18 & 19. Greensboro Monster Jam 2019 tickets go on sale to the public Tuesday, September 25th via Ticketmaster. Featuring eight of the most intense athletes of Monster Jam, Greensboro fans will witness a fierce battle for the championship with each competitor contending in customized high-powered vehicles: Monster Jam Speedsters, Monster Jam ATVs and of course, the iconic Monster Jam trucks in six events sure to leave fans on the edge of their seats. 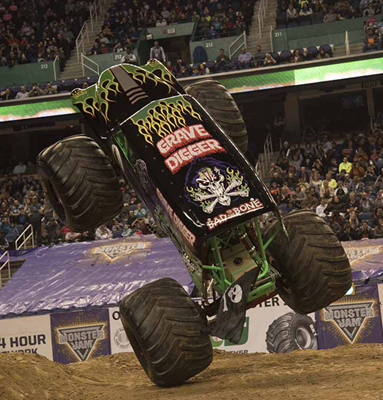 The following trucks are scheduled to appear in Greensboro: Grave Digger, Max-D, El Toro Loco, Alien Invasion, Zombie, Earthshaker. *Trucks/drivers subject to change. Tickets & Pit Passes will be available for purchase online at Ticketmaster.com, charge by phone at 800-745-3000 or in-person at the Greensboro Coliseum Complex.